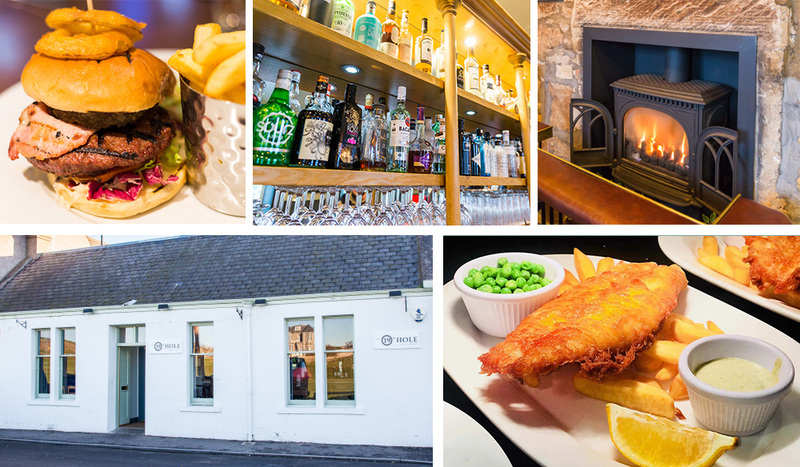 Overlooking stunning Elie Golf Course, the 19th Hole is a traditional pub serving up delicious home-made food, cooked with the fantastic local produce we’re lucky to have on our doorstep here in Fife. As well as a great selection of Scottish ales and Whiskies on offer, our fantastic Gin collection is also growing too! Plus, our feature fireplace with comfy sofas is the perfect spot for a coffee and a good blether. Or, at the other end of the bar, enjoy year-round sporting events on BT Sport and Sky TV while enjoying a drink or two! So, whether you’re looking to spend a relaxing afternoon mingling with the locals, enjoy a well-deserved drink after a walk on the coastal path, or even just tuck into some fantastic food with the family, the 19th Hole extends you a warm welcome!